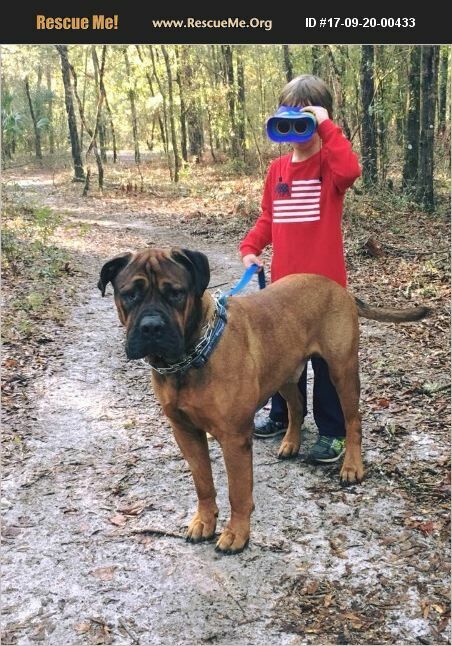 Florida Bullmastiff Rescue View other Bullmastiffs for adoption. NOAA has come such a long way! This 4 year old boy can now walk on a leash, hang-out calmly in his crate and spend easy time around visitors without jumping. NOAA doesn't love cats, but seems very open to large dogs - with proper introduction. NOAA loves children, cuddling on the couch, walks and just hanging out with his people. He enjoys keeping an eye on the house, rides well in the car and does great at the vet. NOAA is slightly more energetic than the average bullmastiff so we look forward to finding him a home that's looking for a spunky young guy to be their best friend. Check out more pictures of NOAA on Facebook at https://www.facebook.com/BRBullmastiffs/. NOAA's adoption fee is $400. If you think NOAA would be the perfect addition to your home please complete the online adoption application at www.bullmastiff.us/rescue. We'll be in touch promptly!